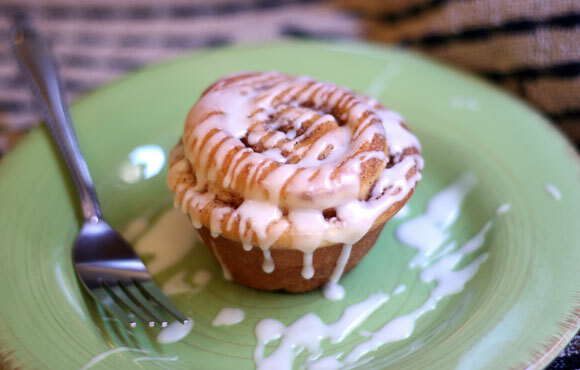 Try baking cinnamon rolls in a muffin tin. Cinnamon Roll Muffins make serving breakfast a breeze. Combine warm water, egg, oil, sugar, bread flour and yeast in the bowl of a stand mixer. Mix until a ball of dough forms. Place in a greased bowl and let rise until doubled in size, about 45-60 minutes. Punch down the dough and turn onto a floured surface. Roll out dough into a 12 inch by 24 inch rectangle. Combine softened butter, sugar and cinnamon together in a small bowl. Spread butter mixture on dough. Roll tightly to make a 24 inch long dough log. Butter 2 muffin tins (24 muffins total). Slice dough with a pizza cutter or pastry scraper into 1 inch slices and place in pans. Let rise until doubled in size, about 45-60 minutes. Preheat oven to 350°F. Bake until golden brown, about 20 minutes. Make the glaze by mixing powdered sugar, vanilla and milk together. Drizzle over the cinnamon roll muffins. Note: This can be prepared the night before to bake in the morning. Refrigerate covered before final rise. Let sit out at room temperature for 30 minutes before baking.